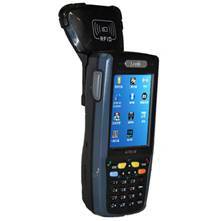 This slim business-class handheld RFID reader provides the capability and quality of warehouse readers at desktop prices. Ideal applications include Retail/Point of Sale, Inspections, Asset Management, Production Line Management, Field Service, ID Badges and Ticketing. With an IP rating of 64 it is rugged enough to also handle industrial and outdoor environments. The RFID module is completely integrated with either 13.56MHz High Frequency or 915MHz UHF supporting all standard tags including ISO14443, ISO15693 ISO-18000-C, EPC Class1 Gen2, EM4122 & EM4444. The ACC671 also offers a complete list of add-ons. Highly secured Wi-Fi (802.11 b/g/n) synchronization including cost-effective VoIP. Bluetooth connectivity linking with wide range of peripherals (mobile printer, headset, etc). Open WEP, WPA2-PSK（TKIP+AES）、TLS、TTLS (MS-CHAP),TTLS(MS-CHAP v2)、TTLS (CHAP)、TTLSMD5、TTLS-PAP、PEAP-TLS、PEAP(MS-CHAP v2)、WPA-AES,Support CCX v4 etc.